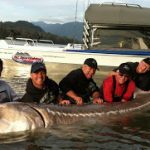 Hosted by BC Sport Fishing Group and the Harrison Hot Springs Resort. Come out for this friendly 3 day competition to see who can catch the ‘big one’. Scoreboards, prizes and reception.